In this video, posted for the fifth week of the E-Learning 3.0 MOOC, Stephen Downes makes the case for open education. He claims that open education can change the world and is a kind of social literacy that can transform society, connect us across the globe, and enable each of us to believe we have the capacity to become an important person in society. Being open in such a society means being accepting of other people and being willing to share. It is about being in a conversation in a community. Open educational resources in such a society are like the words in this conversation. We are forced to think about the words that are used; they can either block us or liberate us. Creating open educational resources is more than giving the resources we have created away for free. It also helps us to develop ourselves. Of course there are challenges for education in taking this approach, in which it is expected that we will embrace the idea of open sharing of our resources and ourselves, and there have been, as you would expect, mistakes and failures. A criticism could be that it has made the rich richer and the poor poorer, but, as Stephen pointed out, the benefits to the poor can still be identified and it can make the poor richer more quickly. Another criticism that is often levelled at open education is that it has a colonising effect, propagating the voice of Western society, but Stephen also pointed out that if you create your own open educational resources, you can promote your own culture. Open online education, using open educational resources, can reach those who can’t access education in any other way. This is the promise of open education and open educational resources. To date, open educational resources have been thought of as content (a product) which are stored on the web, often with creative commons licenses which may allow for free re-use and adaptation. But these resources have become increasingly locked down in content silos and behind paywalls. The distributed web, Web 3.0, is a kick-back against this. On the distributed web, new file-sharing systems, such as the Interplanetary File System (IPFS), do not rely on internet addresses to locate content. Instead they ‘use the hash of the data or content as an address, enabling the data to be distributed across the cloud’, thus creating a content addressable resource. In the traditional model the server is in the middle (see image below), but in this new model, a network of servers is geographically distributed, meaning that when you click on a website you will get content from the local server; it will be accessible from the nearest convenient source. Gradually, but definitely, we are moving towards a distributed web. But I suspect we are some way off fully realising the dream of the distributed web. Cheryl Hodgkinson -Williams and Sukaina Walji, both from the University of Capetown, were Stephen’s guests this week. Cheryl and Sukaina had their feet firmly on the ground as to what can realistically be achieved in the creation and sharing of OERs and the development of open educational practices at the present time. In conversation with Stephen they explored the topics of open educational resources and open practices, considered some of the challenges around re-use of OERs, and discussed the potential of new resource networks (like the distributed web) to address those challenges. This was an interesting discussion. Cheryl and Sukaina shared information about the research project they have been working on, together with groups from across the global south, in which they have been investigating how OERs are being developed, shared and used, and also exploring new methods for distributing OERs using the distributed web. I appreciated their focus on process rather than product, i.e. on the practices surrounding the creation of OERS and the constraints associated with these practices. They were well aware of the differences between the ideological intent related to the creation of OERs and the practical steps needed to ensure an ethical approach. As Cheryl said they have to be pragmatic despite their intention to openly share their practice, process and product. I also appreciated their recognition that many people, whilst able to create a resource, do not have the digital literacy skills to apply a CC license or upload the resource to a site or repository, nor the confidence to openly share their resource with the whole world. Cheryl asked, ‘At what point is something too difficult to get your head round?’ and went on to say that we need a really easy interface, that is more user-friendly. Technology needs to be an enabler. Technology on its own will not enable change. These are important considerations in the further development of the distributed web. It is easy to see that something needs to be done to counter the tyranny of the centralized web and that the distributed web seems to be the way to go. As with all such developments, it will take time for these developments to become sufficiently user-friendly to be accessible to the average internet user. Have you heard about Open Educational Resources (OER) and want to know more? This module presents an overview of what they are, why they matter to post-secondary education, and how to get started on your OER journey. A couple years or so ago UNESCO launched an OER mapping project. It has now come to fruition. “Using local knowledge to describe the OER ecosystem, the OER World Map will visualize the world of OER and support a range of widgets and tools, including powerful statistical analysis.” Here’s the OER World Map blog. It “seems clear that the sustainability of OERs – in a fashion that renders then at once both affordable and usable – requires that we think of OERs as only part of a larger picture, one that includes volunteers and incentives, community and partnerships, co-production and sharing, distributed management and control. What’s the “D” in Dweb?! 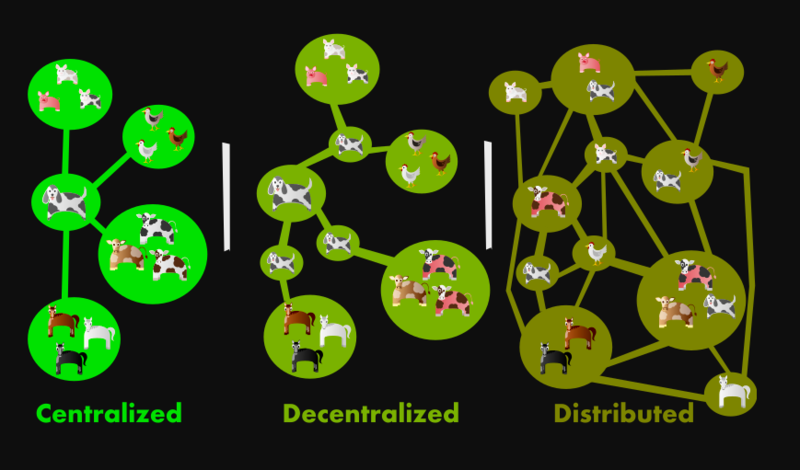 The “d” in “dweb” usually stands for either decentralized or distributed. A few examples of decentralized or distributed projects that became household names are Napster, BitTorrent and Bitcoin. Some of these new dweb projects are decentralizing identity and social networking. Some are building distributed services in or on top of the existing centralized web, and others are distributed application protocols or platforms. Beaker brings peer-to-peer publishing to the Web, turning the browser into a supercharged tool for sharing websites, files, apps, and more. Beaker adds support for a peer-to-peer protocol called Dat. It’s the Web you know and love, but instead of HTTP, websites and files are transported with Dat. IPFS is the Distributed Web, a peer-to-peer hypermedia protocol to make the web faster, safer, and more open. Each file and all of the blocks within it are given a unique fingerprint called a cryptographic hash. When looking up files, you’re asking the network to find nodes storing the content behind a unique hash. Every file can be found by human-readable names using a decentralized naming system called IPNS. In this paper, we endeavour to move beyond social change and social inclusion to develop a framework to make apparent the relationship between social justice and the adoption of OER and OEP. Drawing on examples from the ROER4D project, we propose a slightly adapted version of Fraser’s (2005) social justice framework as a way to map how and under what circumstances the adoption of OER and OEP by students and/or educators may counter economic inequalities, cultural inequities and political exclusions in education. This is try-dat, a tutorial that teaches you how to work with datasets using dat. In this tutorial you will play around with data versioning and syncing workflows, and play with some awesome tools to publish or share data over the peer-to-peer web. A bit more about Dat… Core pieces of the web shape how we communicate and organize. However, these pieces are increasingly controlled by large monopolies. In building Dat, we envision a future of community-driven tools backed by nonprofit organizations.